Pirelli Scorpion Trail 90/90-21 150/70-18 $320.00 with installation. Do contact Izz / Zulfaqar 68446378 for more details. install at toh guan branch. let me know if this can be arranged. Please contact (MJ) 92718999 for arrangements. Hi. Need tyres for 98' ST1100. Models and price please? Any recommendations? Thanks. Hi, what sizes you need 110/80-19 + 160/70-17? How much for both front and Rear tyres. Metzeler, same price at $150 but no stock at the moment. No advise yet from supplier on ETA. Can update me when stock arrived. dear UM, may i know if you have stock for S20 Evo (110/70 for front and 140/110 for rear)? and price? Price inclusive of installation. Please contact me (Izz) 92278999 for arrangements. Michelin pilot power 2ct 120/70 & 150/60 available? I need at your woodlands branch. Require to place order. 50% deposit waiting time 2-3 days. Please contact (Zul) 84818999 for arrangements. How much for Angel GT and Metzeler Z8? Sorry no stock for Metzeler Roadtec Z8. We have stocks for following tyres. do you have metzeler sportec street? 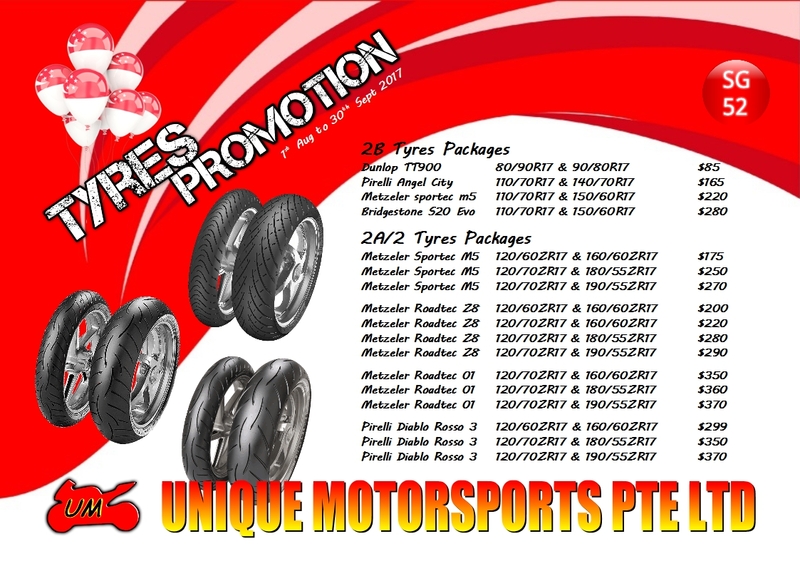 Please contact me (Izz) 92278999 for more information on the tires. Hi able to order in pirelli diablo rosso 3 front 100/80 rear 130/70? What will be the price including installation? And will you bring in pirelli diablo rosso corsa 2 90/80? Please contact (Izz) 92278999 for available choices. Do you bring in Bridgestone bt39ss? Only saw bt39 listed. Please contact me (Izz) 92278999 for more information. Hi, do you still have Metzeler tyres? Roadtec 01. I heard the Metzeler agent in Sg closed down?? Available. Please contact me (Izz) 92278999 on the sizes you need. Hi for Bridgestone bt39 90/80 and 110/80, change wheel bearings and rim valve how much will it be? And can I bring my own bearings and wheel valves?